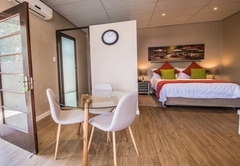 A&A Guesthouse is a guest house with self catering option, providing accommodation in Mill Park for tourists visiting the Port Elizabeth region. 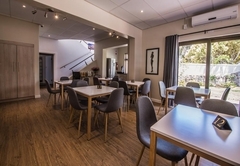 A&A Guesthouse is centrally situated close to the large Greenacres Shopping Mall, next to the Port Elizabeth golf club and within short driving distance of the renowned Port Elizabeth beachfront. 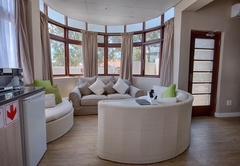 It has wheelchair accessibility and is in close proximity to the 3 major hospitals in town, which make it an ideal stay over for patients and their families. 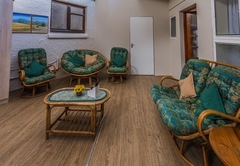 A&A Guesthouse functions on a self-catering principle with a large fully equipped kitchen, outdoor barbecue on the veranda and a small in room kitchenette (fridge, microwave, toaster, kettle, crockery and cutlery, but no stove or sink). Although you can self cater if you wish, we will supply breakfast and dinners on request. 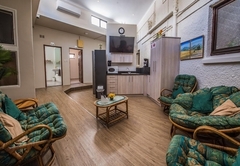 All rooms all have en-suite-bathroom, satellite TV, Internet access, hairdryer, ironing board and iron, honesty bar, air conditioner and small safe. We have seven rooms in total. King-size bed in main bedroom or twins and a bathroom with a bath and shower. 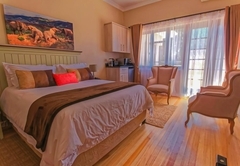 This room has Queen-size bed and an en-suite bathroom with a bath and a shower. 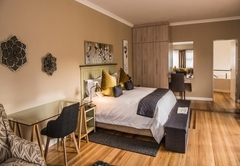 This room has Queen-size bed and an en-suite bathroom with a shower. 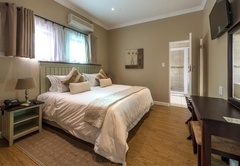 This room has King-size bed or twin beds and an en-suite bathroom with a shower and a bath. 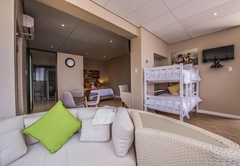 This room has King-size bed or twin beds, a sleeper couch and an en-suite bathroom with a shower and a bath. 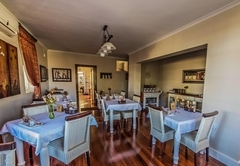 Fully equipped open plan kitchen and lounge area. The bedroom has a Queen-size bed in some units and twin beds (overlay changes it to King size bed) in the other unit. 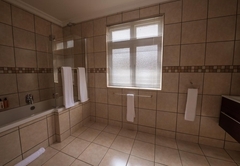 En suite bathroom in bedroom has shower and bath. Two sleeper couches in lounge can sleep 2 extra people. 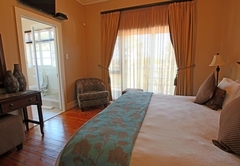 The bedroom has a King-size bed or twin beds and an en-suite bathroom with a shower and bath. Two sleeper couches in lounge can sleep 2 extra people. 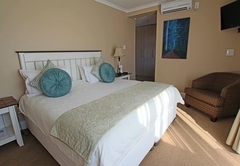 The bedroom has a King-size bed or twin beds and an en-suite bathroom with a shower and bath. Separate room with 4 bunk beds. One sleeper couch in lounge can sleep 1 extra person. 8 bunkbeds in one room. 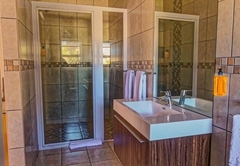 Shared bathrooms, kitchen and lounge area. 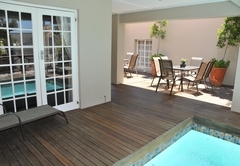 A large indoor heated and cold paddling pool in the garden is for the use of resident guests. Our heated indoor pool is guaranteed to soak away all your stress. We are affiliated with the Health Center next door to us with direct access. 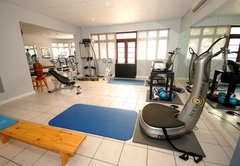 Guests can use the gym facilities of the Health Centre adjacent to the guesthouse after hours. Double Executive Rooms with balcony. Queen size bed, with bath & shower. DSTV, Air-con and free Wi-fi. Kitchenette with cutlery and crockery, bar fridge, microwave oven, toaster and kettle. Please note, no sink or stove. Double Luxury Room with Balcony. Queen size bed, with only shower. DSTV, Air-con and free Wi-fi. Kitchenette with cutlery and crockery, bar fridge, microwave oven, toaster and kettle. Please note, no sink or stove. Double Luxury Room NO Balcony. Queen size bed, with only a shower. DSTV, Air-con and free Wi-fi. 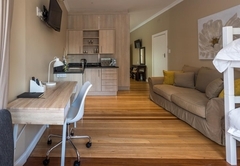 Kitchenette with cutlery and crockery, bar fridge, microwave oven, toaster & kettle. Please note, no sink or stove. 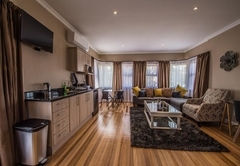 Family Unit with Full Kitchen - King size bed or twins, with bath and shower. 2 sleeper couches. DSTV, Air-con and free Wi-fi. Full kitchen. 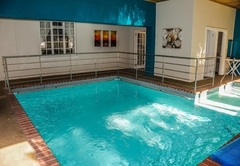 Room opens onto heated swimming pool, with access from parking lot. 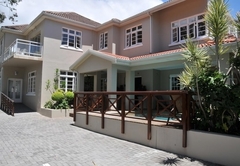 Family Unit with Courtyard & Kitchen - King size bed or twins in main bedroom, with bath and shower. 1 sleeper couch in lounge. Separate room with 4 bunk beds, can use separate bathrooms. DSTV, Air-con and free Wi-fi. Full kitchen. 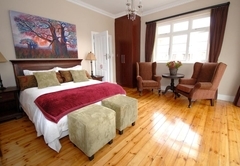 King Room Large with Balcony - King size bed in main bedroom or twins, with bath and shower. 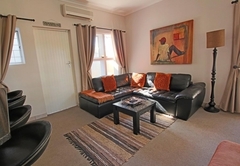 Sleeper couch, DSTV, Air-con and free Wi-fi. Kitchenette with sink, microwave, induction plate, bar fridge, cutlery and crockery. 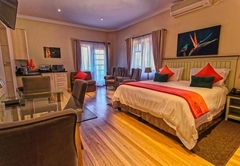 King Room with Balcony - King size bed in main bedroom or twins, with bath and shower. DSTV, Air-con and free Wi-fi. Kitchenette with microwave, bar fridge, cutlery and crockery, toaster and kettle. No sink or stove. Family Unit with Courtyard and Balcony. 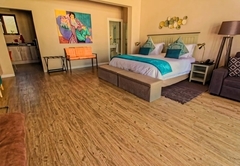 Queen or King size bed in main bedroom, with bath and shower. 2 bunk beds in lounge. DSTV, Air-con and free Wi-fi. Kitchenette with sink, microwave, toaster, kettle, induction plate, bar fridge, cutlery and crockery. 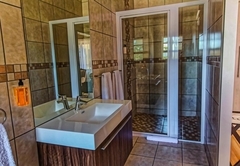 2 single beds, small room, but with big bathroom (only shower). 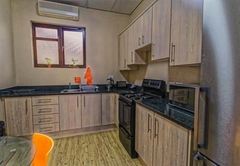 Air-con, DSTV, free Wi-fi.-Kitchenette with microwave, kettle, toaster, cutlery and crockery, but with no sink or stove. Bowl provided for dirty dishes. No balcony, room downstairs in main house. A lovely place, with a nice room. The staff were kind and very helpful. 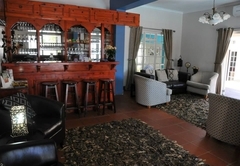 The next time me and my wife are back in Port Elizabeth, we would want to stay here. 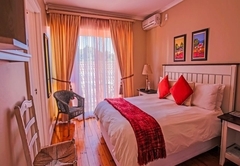 For those who seek a nice place to stay we would warmly encourage you to stay in this lovely guest house, as it is central and safe. We would give it 10 out of 10. A very good stay in lovely room with great service from the staff. Good breakfast and a good locations too. Response timeA&A Guesthouse typically responds to requests in 5-10 minutes. A Camp cot is provided if required.